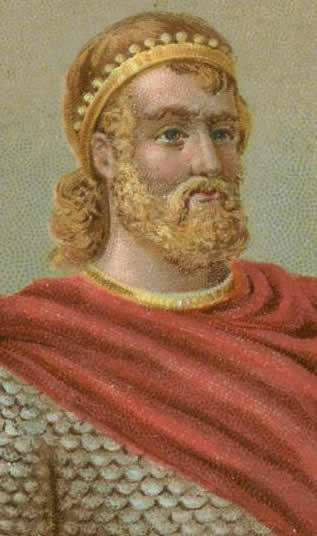 Hardicanute or Harthacnut was the son of King Canute and Emma of Normandy and spent his childhood in Denmark, having been sent there by his father as an act to strengthen defences and legitimacy. Earl Ulf, Canute’s brother, headed a council to aid the young Hardicanute. Ulf alienated his brother by making the Danish provinces acknowledge Hardicanute as King without reference his father’s overall authority and failed to meet Norwegian and Swedish invasions properly. In 1027, Canute arrived back in Denmark and had Ulf executed for his insubordination, but forgave his young son and made him next in line for King of Denmark. Upon the death of his father in 1035 Hardicanute succeeded his father on the throne of Denmark and while his brother Sweyn became King of Norway, Hardicanute’s position of King of England was usurped by his hated half-brother Harald I Harefoot, Canute’s son by either a mistress of his first wife. While Hardicanute was involved in a war against King Magnus I of Norway and unable to secure his claim of King, Harald was appointed regent in England and then promptly betrayed his brother and took the throne for himself. Hardicanute came to an eventual agreement with Magnus through a treaty either in 1038 or 1039 and terms stated that if either died without an heir, the opponent would become his successor. Hardicanute likely agreed to this settlement as he no plausible candidate to rule Norway and he was personally inclined to avoid campaigns and wars. Emma of Normandy was exiled in Bruges and plotted to gain the English throne for her son Hardicanute, by sponsoring the Encomium Emmae Reinae which eulogised her and attacked Harald’s character, specifically his role in arranging the murder of Alfred Atheling in 1036, the youngest son of Emma from her marriage to the late Ethelred. One historian believes that this work was the final straw for Hardicanute and persuaded him to invade England. The treacherous Harald I Harefoot died on March 17, 1040, while Hardicanute was planning an invasion, and this allowed for the latter to peacefully ascend to the English throne. Hardicanute’s ascension was a peaceful one, but he had decided on taking all precautions necessary and arrived in England as a conquered with an invading force of sixty-two warships. The numerous crew had to be paid for their service and to pay them Hardicanute levied a tax of twenty-one thousand pounds, making him terribly unpopular. Many in England were hoping for the just rule of Canute to be reinstated but they were sadly mistaken, Hardicanute’s first act upon arrival was to have Harald’s body dug up, beheaded and dumped in a swamp causing the outrage of the church who were at one time some of King Canute’s greatest allies. 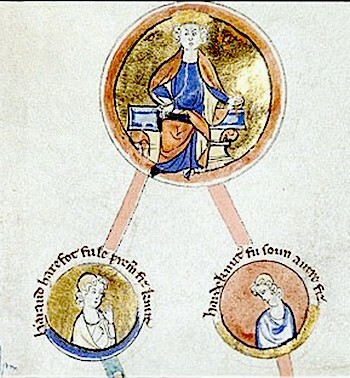 Godwin, the Earl of Wessex, had handed Alfred over to Harald, and he was charged by Emma of Normandy in a trial before Hardicanute and members of his council. Godwin was able to escape punishment as he had acted on Harald’s orders and offered a hefty bribe of a richly decorated ship to Hardicanute. Hardicanute was remembered as brutal and extremely vengeful. The English people had become used to a King ruling with the advice of a council; however, Hardicanute had ruled autocratically in Denmark and was not willing to change his ways nor did he trust the leading Earls. His reign was extremely unpopular due to exacting high taxes on the people of England. He doubled the size of the English fleet from sixteen to thirty-two ships which allowed him to have a force capable of dealing with trouble elsewhere in his empire but to pay he heavily increased the rate of taxation. Unfortunately, this increase coincided with a poor harvest resulting in severe hardships for the people of England. The people of Worcester rose in protest, killing two harsh tax collectors and in retribution Hardicanute imposed a legal but unpopular law of “harrying” burned their city to the ground. From there he sullied his reputation even further by having the Northern Jarl Edwulf murdered. Edwulf ruled the north state in semi-independence and accidently gave offence to the King in 1041. After seeking reconciliation, Edwulf was promised safe conduct by Hardicanute who then colluded in murdering the Earl with Siward who replaced Edwulf as the Earl of Northumbria. The crime was widely well known and widely condemned, the Anglo-Saxon Chronicle describes Hardicanute as an “oath-breaker.” The Chronicle that spoke so highly of his predecessors stated that Hardicanute did nothing worthy of a King during his entire reign. Hardicanute, encouraged by his mother, after he had experienced several bouts of illness invited his half-brother Edward the Confessor from exile in Normandy to be his heir. Hardicanute was unmarried and had no known children. After only two years in power, Hardicanute who was known for his love of wine, drink and food suffered a seizure during a rambunctious drinking bout in Clapham. In celebration of the marriage of one of his thanes, “…he died as he stood at his drink, and he suddenly fell to the earth with an awful convulsion; and those who were close by took hold of him, and he spoke no word afterwards.” He died on June eighth, 1042 most likely due to a stroke brought on my excessive intake of alcohol. Succeeded by his Saxon half-brother, Edward the Confessor, the old Saxon line was restored and Hardicanute, the last Scandinavian ruler of England, was buried at Winchester Cathedral near his father.